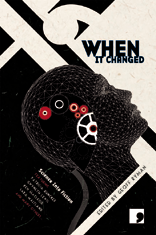 When It Changed is an attempt to put authors and scientists back in touch with each other, to re-introduce research ideas with literary concerns, and to re-forge the alloy that once made SF great. Composed collaboratively – through a series of visits and conversations between leading authors and practicing scientists – it offers fictionalised glimpses into the far corners of current research fields, be they in nanotechnology, invertebrate physiology, particle physics, or software archaeology. From Planck's Length (the smallest indivisible distance) to Plankton (potential saviours of the Earth's ecosystem), from virtual encounters between Witgenstein and Turing, to future civilisations torn asunder by different readings of the Standard Model, together these stories represent a literary 'experiment' in the true sense of the word, and endeavour to isolate a whole new strain of the SF bug. Dr. Jennifer Rowntree, post-doctoral researcher, Faculty of Life Science, University of Manchester. Rowntree is a plant evolutionary ecologist whose reseach includes "genetics of plant-plant and plant-animal interactions and the value of genetic diversity in plant communities." Dr. Matthew Cobb, Programme Director Biology, the University of Manchester. Cobb and his laboratory study how genes and environment shape animal behavior and communication. Most of his research has focused on pheromones and olfaction in fruit flies. Cobb was paired with writer Simon Ings, who wrote the story "Zoology" for the anthology. Professor Steve Williams, Williams develops and uses magnetic resonance imaging techniques to study appetite regulation and gut-brain interctions. Professor John Harris, Lord Alliance Professor of Bioethics, and Director of the Institute for Science, Ethics and Innovation, University of Manchester. He has written a number of books, including Enhancing Evolution: The Ethical Case for Making Better People and On Cloning. When it Changed had it's UK debut at an apparent joint event of the overlapping Manchester Literature Festival and Manchester Science Festival (which runs through the weekend -TThere's a lecture on "Exploring neuroscience through literature" on Sunday, Nov. 1, which is right up Bio in SF's alley). You can read all about the October 24th panel on the Manchester Literature Festival Blog. When it Changed will be released in the US in April 2010. This looks great! :)Thanks for the post it is now on my tbr list. I love your site - a bit esoteric for me at times. But hey I am no scientist/biologist and maybe some of it will stick in my brain.